Impossible to save the image of the disk using the ISO format. Insert another disc or select the Global-Image (GI) format. How to solve this issue? My goal is to obtain an ISO file. Is this possible with Roxio Creator or not? If not, may I please learn why? If not, is it possible with other softwares or it is not possible at all? If so, what can ISO be used for? Creator 2012 is not W-8 or W-8.1 compatible! What do you want to do with the iso file? There are all sorts of free programs that can create iso file from a DVD disc, (Imgburn is an example). Of course if the DVD is a commercial, copyrighted disc, most software will not allow you to make a "copy"
I have 2012 running without any issue. May I please learn what is not compatible with Windows 8.1 and why I cannot use 2012 saving some money? I create a new video and wish to create an ISO file so that next time I need to make more copies of the video I created I just select the ISO file and am ready to burn a new DVD. I have my own CD Audio recordings and wish to make an ISO just in case it gets damaged. I purchase a new IT device that comes with DVD media. I wish to create an ISO so that if I loose this media I can get hold of it. I wish to use ISO format so that if I will not use Roxio Creator anylonger I can still use those ISO files I created. Also, I do not understand wjy ImbBurn works so great and am able to create ISO of this DVD but with Creator 2012 which I paid for it I cannot. This is not correct! Do I have to spend €49 to upgrade to nxt version? Will I then have the opportunity to create ISO files? Will it do it??? I tried to download Imgburn but it contains virus (openCandy) and my antivirus alwasy promt me to delete it. Sorry, Roxio has not told us what parts of the suite are compatible and what parts aren't. Compatibility seems to range from "No problems" in some parts to "No way in hell" for others. Also we have reports things sometimes work well for ages, then inexplicably fail. I personally think "Not compatible" means "No Guarantees!" I wish to use ISO format so that if I will not use Roxio Creator anylonger I can still use those ISO fil/es I created. You can make ISOs with video or data DVDs, and CDs, but not with Audio CDs. The ISO standard doesn't allow it. 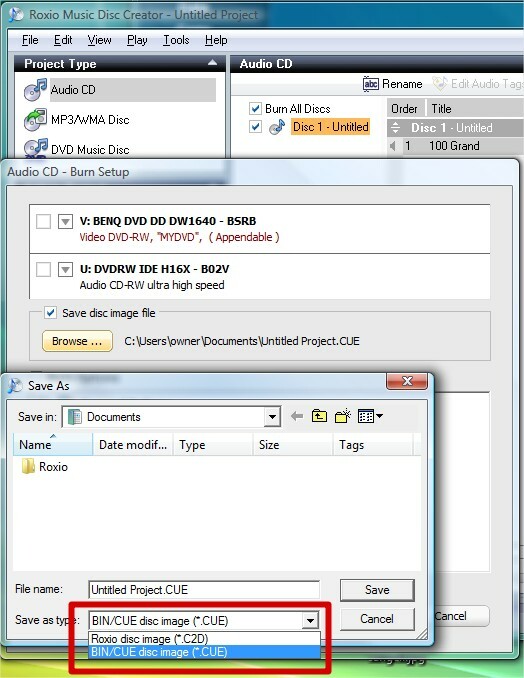 For Audio CDs you need to save a C2D image file or BIN/CUE combination. This limits you, but there are no universal CD-Audio image types because of the CD-Standard, so you're stuck with C2Ds or BIN/CUE. That is correct. ImgBurn is compatible with Windows 8.x, but Creator 2012 isn't. Remember? Creator NXT will save Video or data DVDs, and data CDs, to ISO format, and will also save Audio-CDs to C2D or BIN/CUE format. Same as Creator 2012, except that NXT is Win 8.x compatible. It's not a Roxio problem, but you should always download programs from the people who write them. Other sites such as CNet, and Softpedia try to make you download adware, commercial ware, and in some cases malware as well as the program you're wanting.. The manufacturer's site for ImgBurn is www.imgburn.com. I hope this has explained things for you, but please feel free to ask if I've left you with further questions about this. Opencandy isn't a virus, it's a plugin used by the installer that offers 3rd party software as part of the normal wizard. You are free to opt out of anything you don't want. So, I regret but your suggestion does not help. Unfortunately, money induce some developers to use OpenCandy, reguardless. 2. You state that "You can make ISOs with video or data DVDs, and CDs, but not with Audio CDs". Unfortunately, Roxio Creator 2012 does not allow me to create an ISO of my Video DVD and this is why I had to opt for Global-Image (GI) format. 3. When I was stating that "Also, I do not understand wjy ImbBurn works so great and..." I was referring to the fact that ImbBurn was able to succesfully create an ISO file of my Video DVD, something Roxio was not able to do. Why is this happening? This is the part I do not understand. Please see attached file. 4. You mention that "Creator NXT will save Video or data DVDs, and data CDs, to ISO format". Does this mean that, contrary to Creator 2012, NXT will be able to do what I am not currently able to do but able to do with ImgBurn? Can you please elaborate, if possible. Question 1 - what can I say? The mighty dollar strikes again. He is correct though, these sites do have to give you an option to opt out. You have to read the messages they give you. Questions 2, 3, and 4 - My Creator 2012 allows me to make an ISO from a video-DVD because I am not running it under Windows 8.x. Yours won't allow that under Windows 8. I believe that's because Creator 2012 isn't compatible with Windows 8. That's what I have been trying to tell you. only now I understand: it is Windows 8 that creates this ISO issue. No need to apologize, sometimes things get missed in the translation.